Could sales improve if we provided our technically savvy sales and support people some targeted sales and negotiation training? Too much sales training? I believe most sales and customer service people have had too much sales training and not enough buyer training. I help you focus on understanding and influencing the buyer and their buying process. This creates an understanding of the timing and method for utilizing effective sales techniques. Technical sales or sales support people are indispensable when their needs analysis skills are fully integrated with a desire for and skill for getting an order. My sales training of your people is based more on helping them understand purchasing procedures than promoting sales techniques. Diagnosing before prescribing is something everyone agrees with but often forgets to practice. “Unspectacular preparation precedes spectacular presentation!” Most people know what questions are, but have never practiced them to the point of perfection. There are 4 types of questions and each has a distinct purpose in leading to a decision. The right decision might be a “no” from the buyer and that “no” might save your company considerable profit margin from the installation and support of the “wrong” solution. “Real play vs. role play” prepares salespeople to apply new skills on actual calls within the coming weeks. Many of my sales and service clients have technical degrees or some technical training. I am good with the sale of equipment, parts and service where product expertise is critical BUT still not enough. Video feedback, real play, and re-practice are indispensable ingredients to helping professional salespeople change their minds first and change their behavior second. A changed mind allows a salesperson to add new skills with congruence and comfort. Without a change in their beliefs, people may force themselves to use skills that leave them feeling and looking phony. Therefore, I work with “real play” examples that use video feedback to help people practice, see how to make it better, and immediately re-practice at a higher level of professionalism. If your people are intimidated by learning through video feedback, I am probably not a good fit for your organization. Or, it will take longer to show a positive ROI on my efforts. 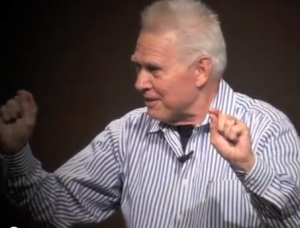 Listen to audio of Don Thoren in a live sales seminar.